FAYETTEVILLE, Ark. – Florida State sophomore Darryl Haraway lived up to his Twitter handle – @ina_flash_4 – Friday, winning the Tyson Invitational 60-meter dash final in a lifetime-best time of 6.59, which puts him among the all-time Seminole greats. Exploding from the gun out of lane two, Haraway was first to the finish line in the eight-man field which included two-time former champion Cameron Burrell of Houston, who finished second in 6.63. Haraway, who matched his previous best (6.64) to reach the finals, equaled the No. 2 time in the nation this year and tied former Florida State greats Walter Dix and Michael Ray Garvin for No. 9 on FSU’s all-time list. He is just the second Seminole to win the 60 title at the one of the nation’s most prestigious races, joining 2013 champion Marvin Bracy. Argro couldn’t have been happier for his young pupil, who avenged an earlier loss to Northern Iowa’s Brandon Carnes this season. Carnes, who beat Haraway with a 6.59 at Iowa a month ago, was fourth in 6.67 after beating the Nole in semifinal with a 6.60. While Haraway provided the lone win of the day, his lifetime-best was one of nine on the day by the Seminoles. Sophomore Peta-Gay Williams twice lowered her previous best in the 60-meter hurdles, capped by her 8.15 in the final to place sixth. The Jamaican edged closer to her first NCAA Indoor Championships appearance by moving up three spots on the national descending order list into a tie for 12th place. “She executed a lot of things well, which is what we came here to do against top competition, but she left quite a bit on the table from the prelims, where she had a much better start,” FSU assistant coach Brandon Hon said. “If she gets out [of the blocks] like she did in the prelims and finishes like she did in the finals she’s 8.01-8.04 at least, and maybe she wins. 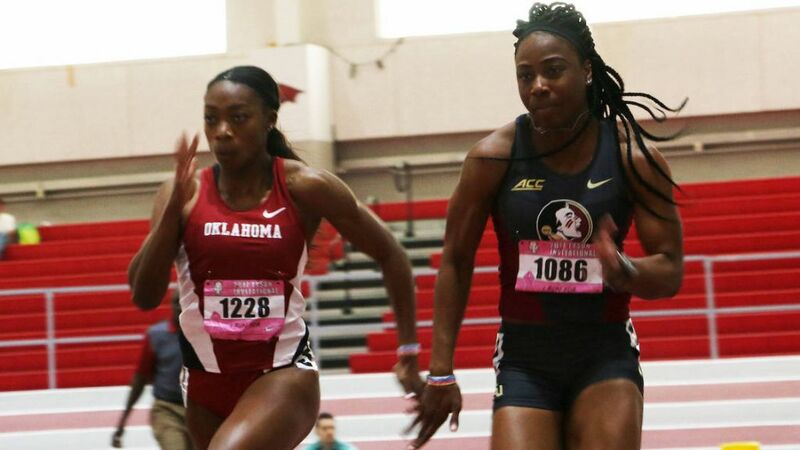 Fellow sophomore Jamaican Shauna Helps came up short of advancing to the finals of the 60-meter dash, but she put together back-to-back times of 7.39 to move up to eighth on FSU’s all-time list. Fellow 60-meter sprinters Kiera Brown (7.54) and Cierra Jones (7.74) also posted career-bests. Sophomore Shaquania Dorsett lowered her personal-best in the 400-meter dash to 54.44; good for an eighth-place finish in an event that also produced a new best for freshman Kimmie Cunningham (57.62). On the men’s side, freshman Kyle Fearrington celebrated a major breakthrough in the 400, lowering his previous best by more than a full second as he finished in 47.93. Veronika Kanuchova overcame a pair of early fouls in the weight throw to make the final on her third attempt, then jumped a spot to finish eighth overall with a new personal-best of 17.63 meters (57-10.25). The Seminoles will return to action Saturday at 12 noon (ET) when Nicole Breske opens competition in the pole vault. Among the Noles competing in featured events will be Eleonora Omoregie (women’s high jump), Ed’Ricus Williams (men’s high jump), Gleneve Grange (shot put) and men’s triple jumpers Armani Wallace and Montel Nevers. Sophomore Carmela Cardama Baez trimmed 13 seconds off her previous best in the 3,000-meter run to join a list of all-time Seminole greats. The Spaniard finished third overall in 9:18.20 – the seventh-fastest time in program history – at Boston University’s David Hemery Invitational. She took her place on FSU’s top 10 list ahead of 2016 Olympians Linden Hall and Violah Lagat, among others. Overall, it was a productive performance by the Seminole women’s distance runners. The day began with redshirt sophomore Madison Harris and freshman Ginelle DeMone recording personal-bests of 2:10.26 and 2:12.67 in the 800. Junior Bridget Blake finished third in her heat of the mile with a season-best of 4:45.14, with recent transfer Emily Edwards (4:48.61) lowering her previous personal-best by a whopping eight seconds. Catherine Blaney and Mackenzie Landa closed the night with new season-bests in the 5000, finishing in 17:19.34 and 17:28.85. While the women will head home, the men’s distance team will take over the action Saturday at Boston University.